Get the 72 card set printed in color! Movers & Shakers was a fun game, so how do we make it MORE fun? Double the cards with an expansion set! That includes: 18 movers cards, 18 advanced movers cards, 27 feeling acting cards, and 9 shakers cards to mix up the rules. Movers & Shakers was a fun game, so how do we make it EVEN MORE fun? Add ANOTHER expansion set with a NEW category of cards! 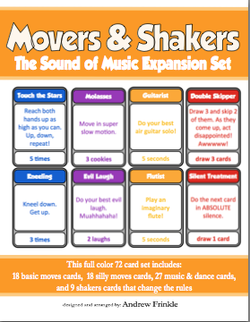 That includes: 18 movers cards, 18 advanced movers cards, 27 music & dance cards, and 9 shakers cards to mix up the rules. Movers & Shakers was a fun game, so how do we make it EVEN MORE fun? Add yet ANOTHER expansion set with another NEW category of cards! 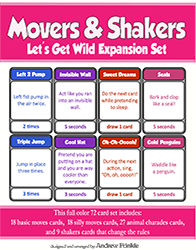 That includes: 18 movers cards, 18 advanced movers cards, 27 animal charades cards, and 9 shakers cards to mix up the rules.